Always try to watch a classic on the big screen, and this Herzog gem's reissue in London was my chance to finally see it up where it belongs. It makes a huge difference, right from that dramatic opening scene of the conquistadores descending a near vertical path down from the Andes into the Amazon. This is a fictionalised tale of Pizarro's quest for El Dorado in 1560, following a group of Spaniards (speaking German, but never mind) and their Inca slaves into the deepest, darkest rainforest. 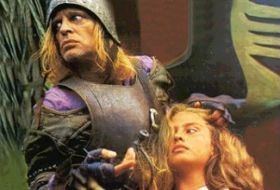 There the second in command, Aguirre (Kinski at his most wide-eyed and manic), mutinies and takes control, declaring himself "the wrath of God" and pushing forward even as his party is decimated by disease and the arrows, spears and darts of virtually invisible natives. Herzog is on top form here, painstakingly recreating the journey and then photographing it in documentary style. Much is improvised, jerky and surprising as we basically watch the cast live the same experiences as the characters they're portraying. There are strong echoes of Richard III in Aguirre's power-mad quest, especially when he sets up the expedition's token royal (Berling) as Emperor of El Dorado. And the film is also a precursor to Coppola's Apocalypse Now as the rafts drift silently down the Amazon with its unseen enemies, muddled motivations and ill-defined destination. Quiet and atmospheric, creepy and grisly, drenched in both equatorial sunshine and scarlet blood--the film is startlingly powerful as it subtly examines themes of imperialism, corporate greed and ultimately personal madness. And yes, it's all completely unhinged as well ... but with haunting Andean panpipes playing in the background. Unforgettable.